Last week, I did something I’ve never done before. I asked my Facebook page followers to vote on this week’s recipe. 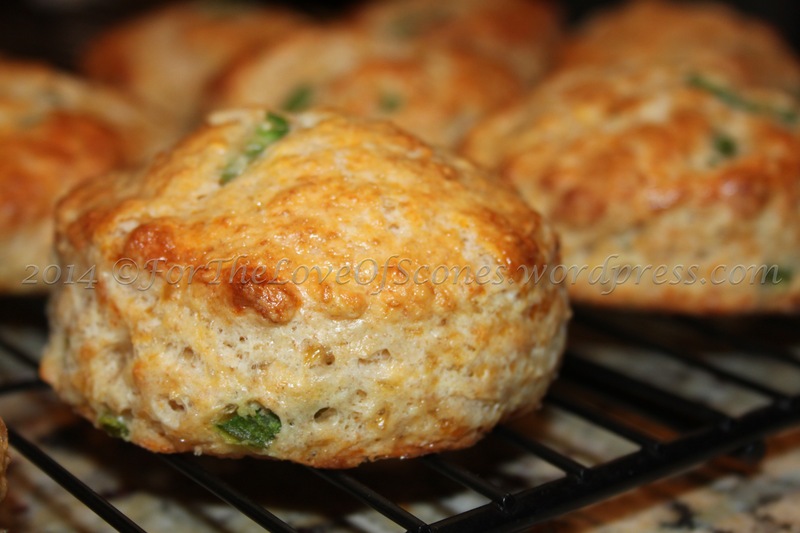 Out of five recipes, Jalapeño-Cheddar Scones were the clear winner. A deep golden color, these are some attractive, enticing scones, if I do say so myself! 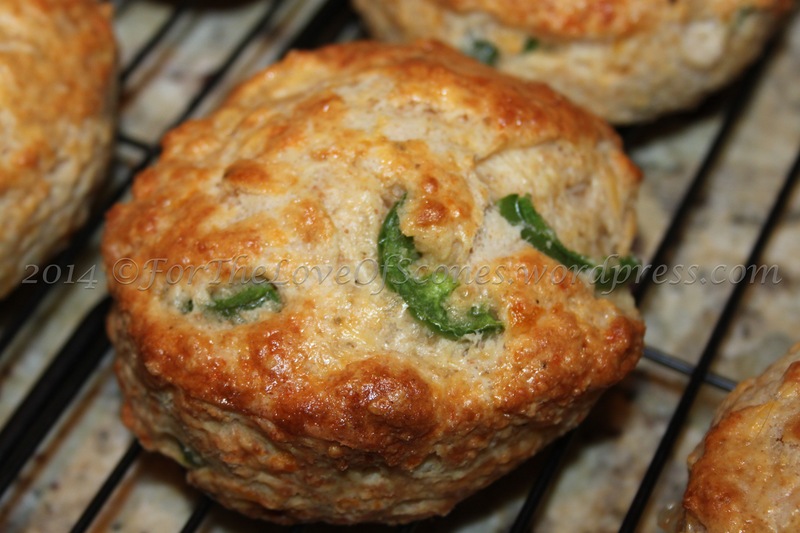 I was excited to get to make these–I don’t think I’ve thrown jalapeños into a scone before, but they turned out pretty well. Since my batch seemed just a tad bland to me, I adjusted the salt to bring out a bit more flavor. The 2 cups of cheese seems generous, but I felt that I could have added even more to give it an extra-cheesy flavor. I definitely recommend extra-sharp cheddar here, the sharpest you can find, as the rest of the ingredients drastically dilutes the flavor of the cheddar. 1) Preheat the oven to 425ºF. 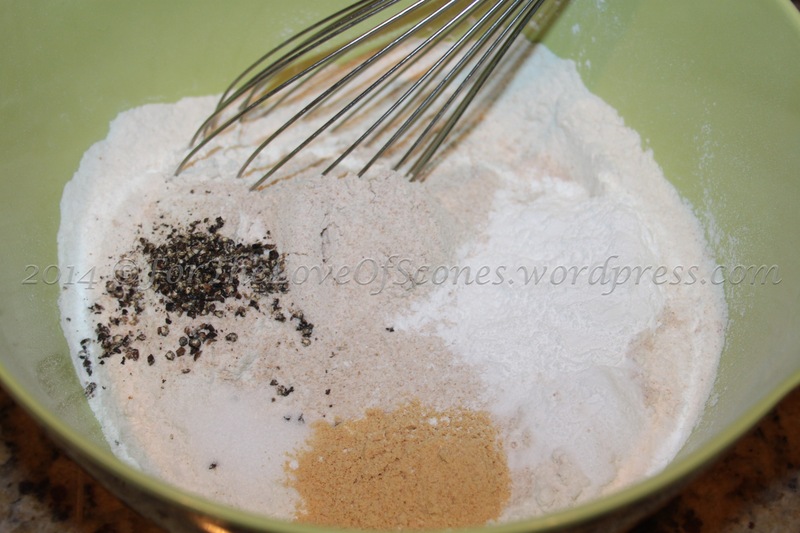 Whisk together flours, salt, baking powder, baking soda, dry mustard, and pepper. 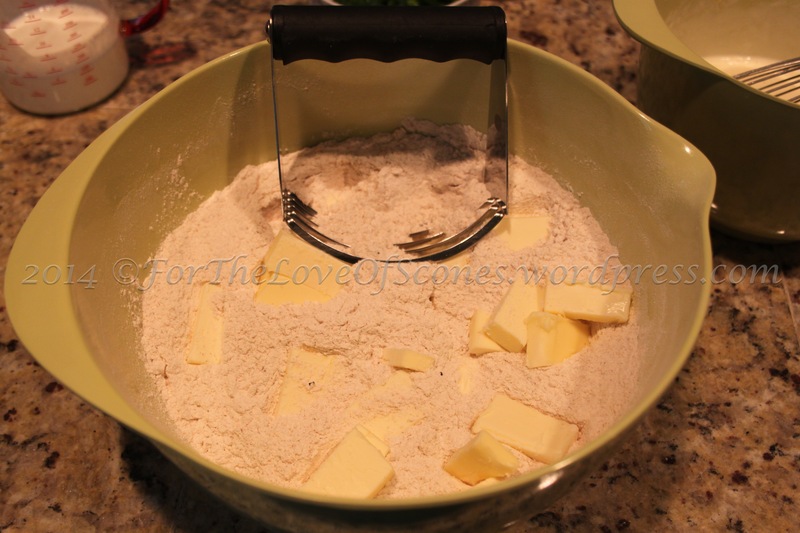 2) Add the cold butter and work into the dry ingredients with a pastry blender. Some larger, pea-sized chunks are okay. 3) Add the shredded cheese and jalapeños to the dry ingredients and toss to mix, breaking up any cheese clumps with a wooden spoon. 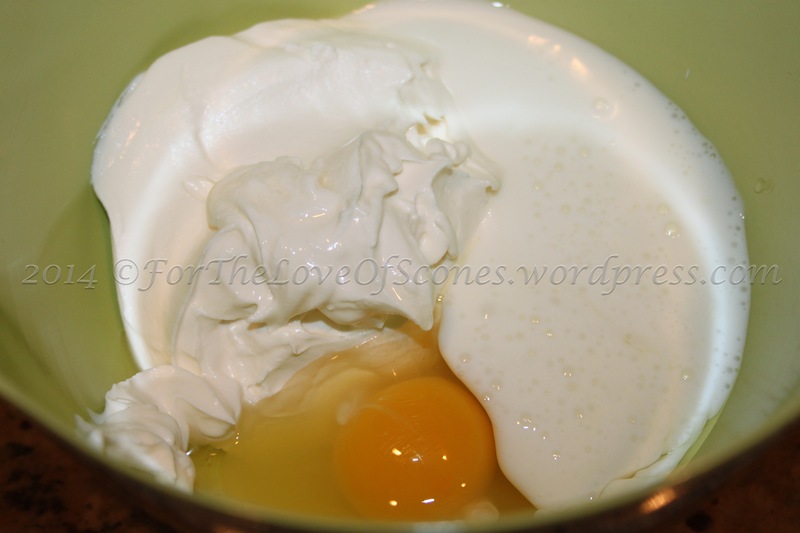 4) In a small bowl, mix 1/2 cup buttermilk, the sour cream, and 1 egg together, whisking lightly to combine well. 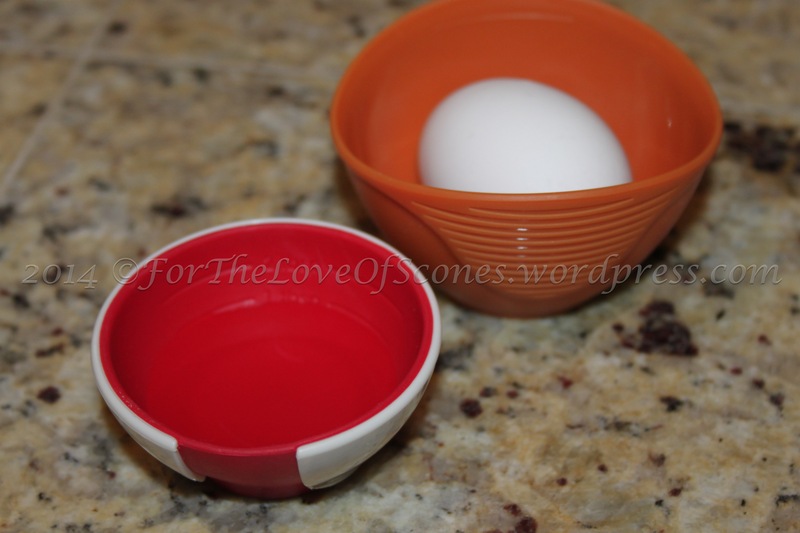 In a second small bowl, combine the second egg and water, and whisk with a fork until combined. Set aside. 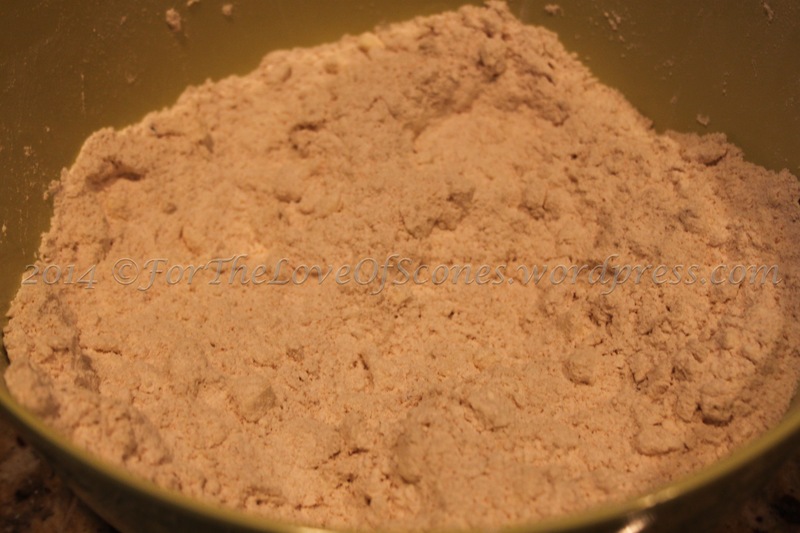 5) Create a well in the middle of the dry ingredients and pour the buttermilk mixture into it. Stir with a wooden spoon to mix. 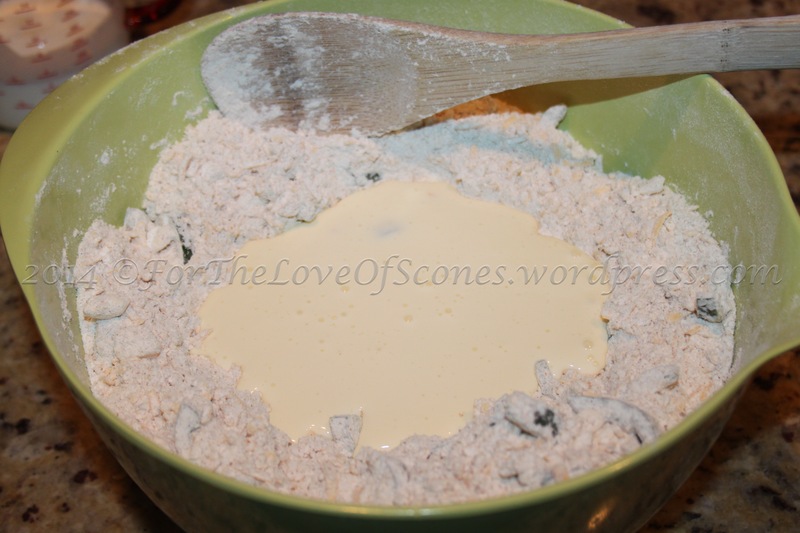 6) Add additional buttermilk, if needed, until you have only a few dry crumbs remain unincorporated. 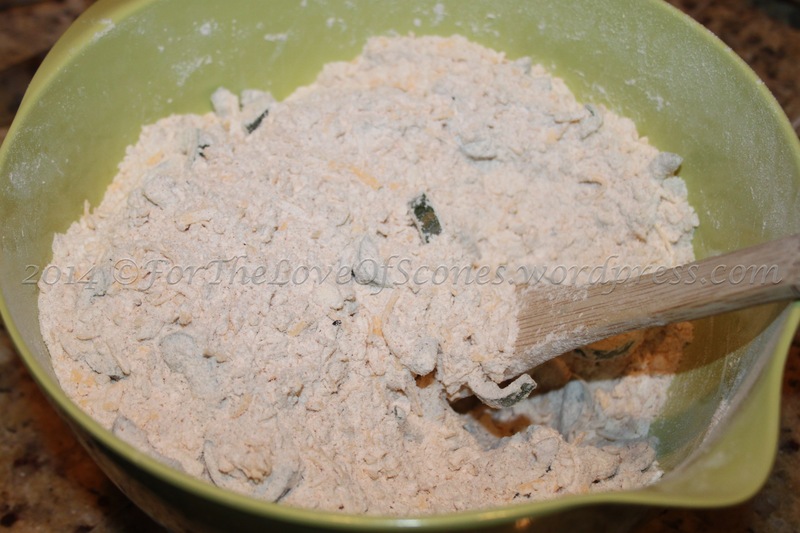 7) Turn out onto a lightly floured countertop and knead three or four times to bring the dough together and incorporate any dry bits. Try not to over mix. 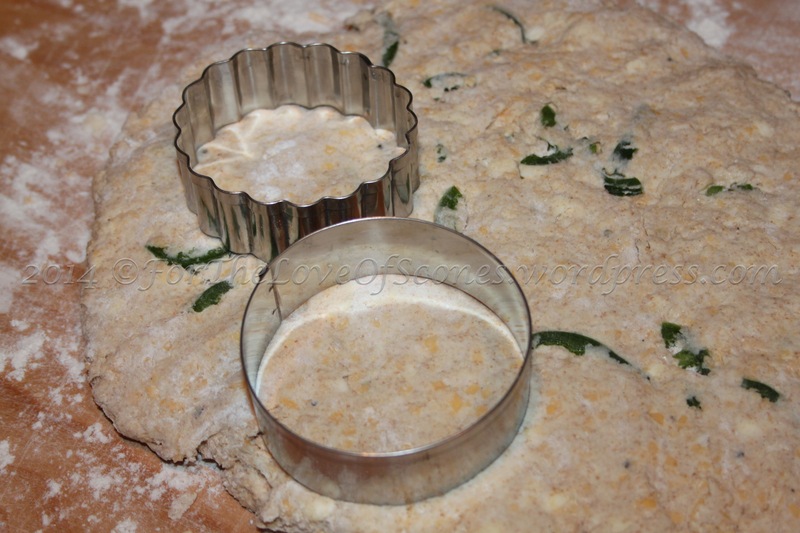 8) Flatten out dough so that it is about 1/2- to 3/4-inch high. Using a 4-inch cookie cutter (or the rim of an inverted drinking glass), cut out as many rounds as you can. When you have only scraps remaining, knead the scraps together just enough to prevent the dough from breaking apart, and cut out more rounds. Repeat until you have to freeform the last one or two scones. 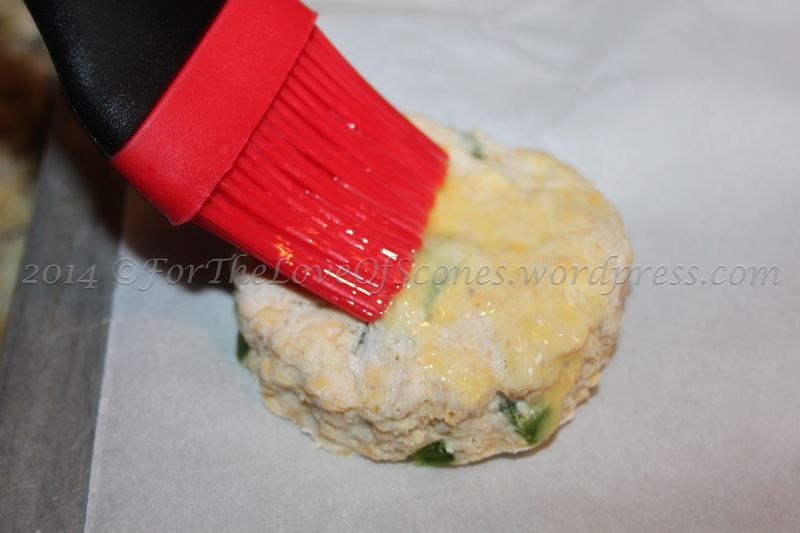 9) Transfer to a parchment-lined baking sheet and brush with the egg-water glaze. 10) Bake at 425ºF until golden on top. The scones should smell strong and cheesy at this point. 11) Transfer to a cooling wire and allow to cool for several minutes. Best enjoyed warm, but they also taste delightful once cool. First step: always measure out the ingredients! Mine are doubled (with the exception of the egg, because I totally missed that until I went to combine it with the sour cream and buttermilk). 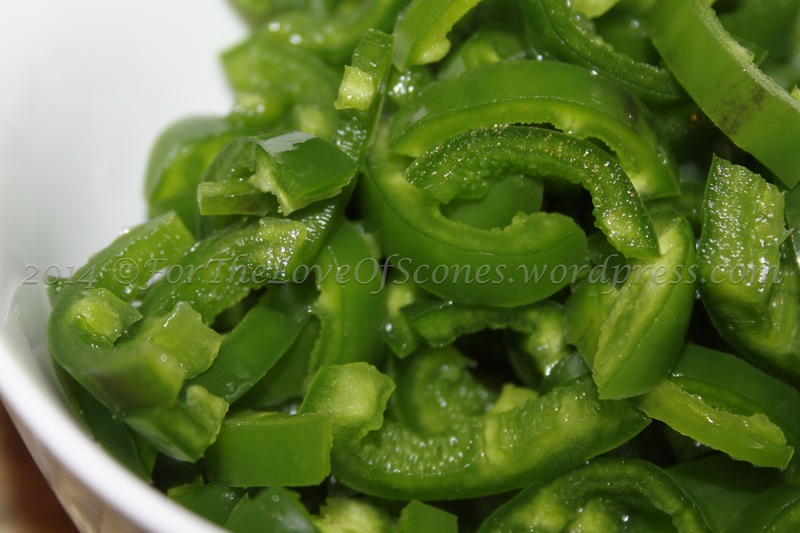 Jalapeños, destemmed/deseeded, and chopped into half moons. Ingredients for your glaze (this makes the scones shiny and extra golden). Combine the egg, sour cream, and 1/2-cup of buttermilk. 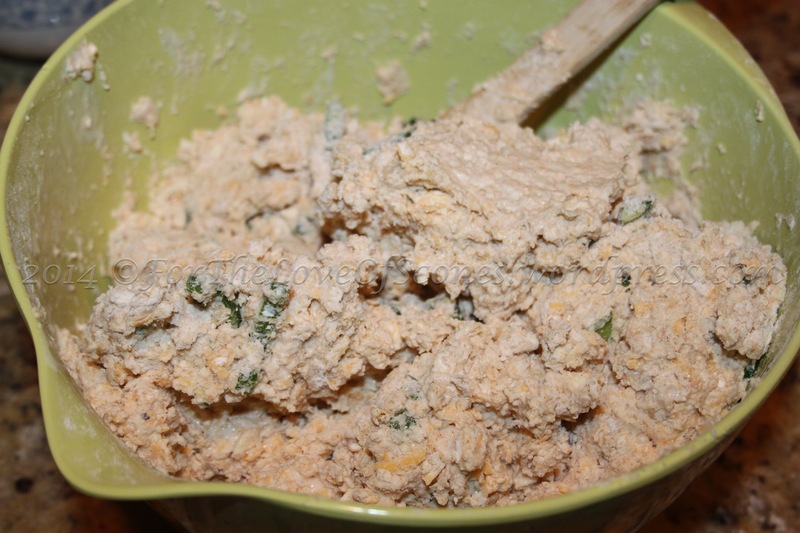 Whisk lightly to mix, just so that there are no huge chunks of sour cream and the mixture homogenous. 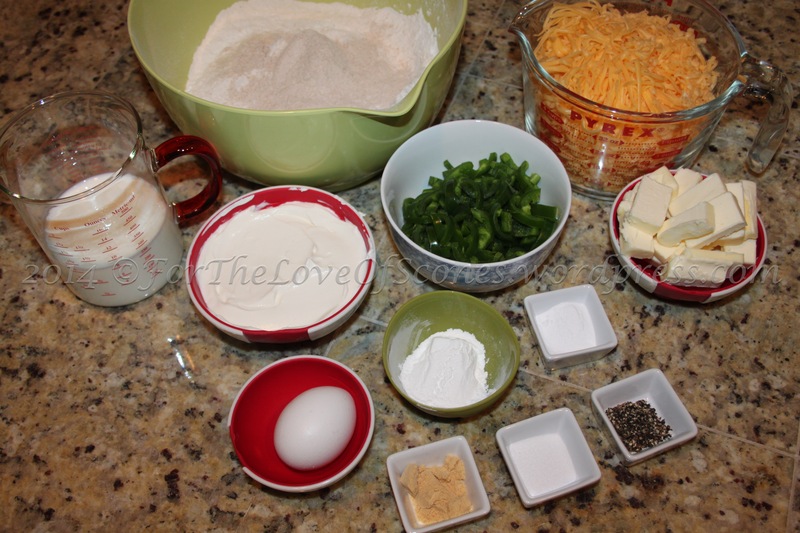 Add the butter to the dry ingredients and blend with a pastry blender. 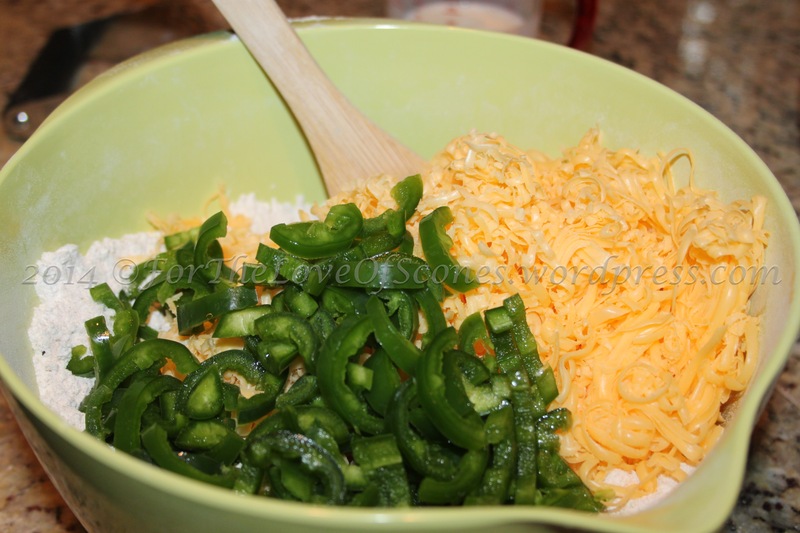 Add the jalapeños and shredded cheddar to the dry ingredients and stir with a wooden spoon. Break up any large chunks of cheese. Toss well to coat all the cheese and jalapeños with flour. Add the buttermilk mixture and mix with a wooden spoon until combined. Add additional buttermilk until only a few dry crumbs remain unincorporated. 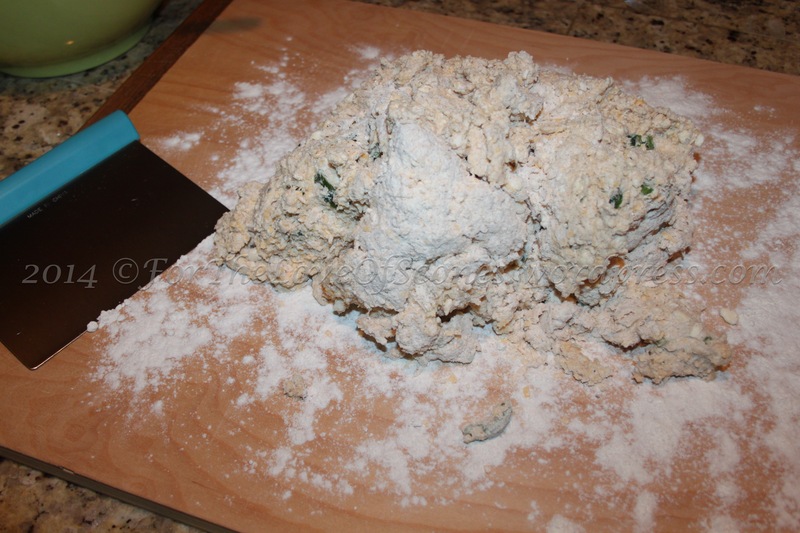 Turn out onto a lightly floured countertop and knead a few times to work in the dry bits. 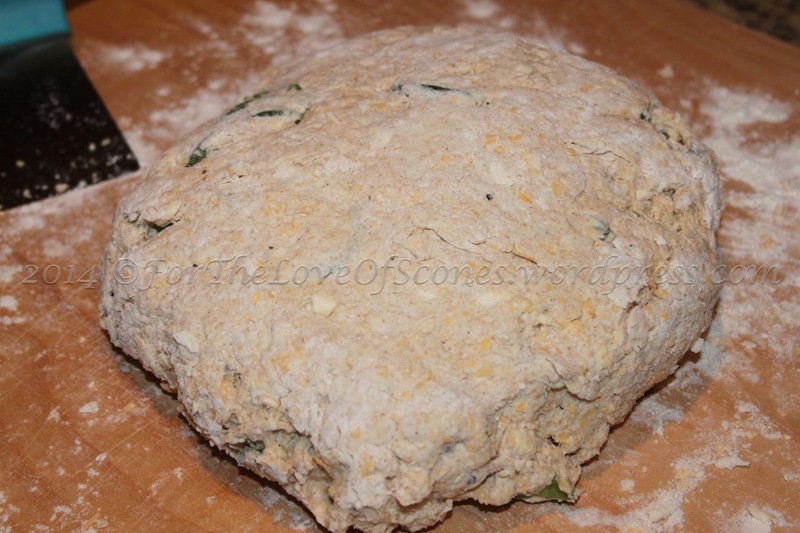 When kneaded, the dough should be uniform and smooth. Don’t over knead. 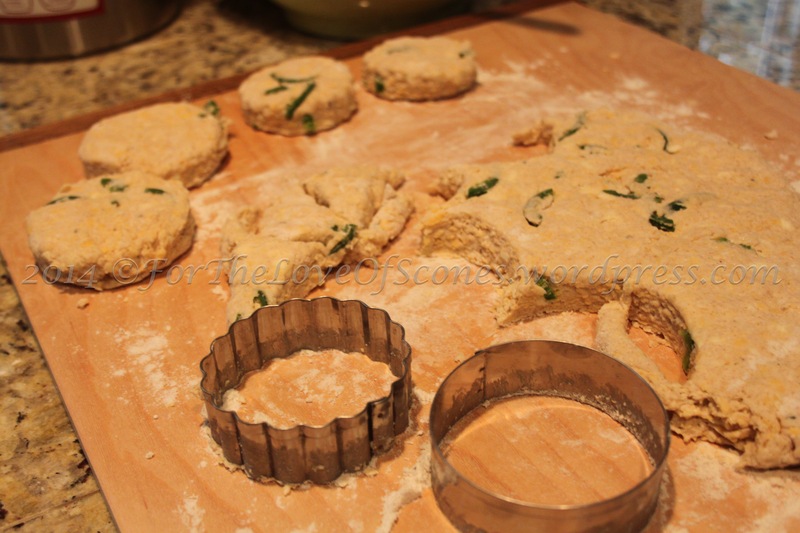 Flatten out the dough to a height of 1/2- to 3/4-inches, and cut into rounds with a 4-inch cookie cutter. 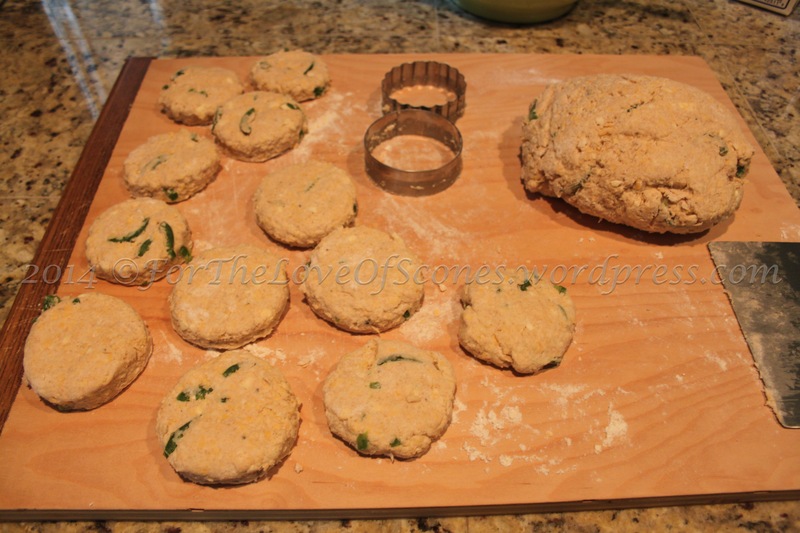 Knead back together any scraps and cut out additional scones until you have only scraps remaining. Free form those scraps into scone shapes. Transfer to a parchment-lined baking sheet and brush the tops of the scones with the egg glaze. As I said, my batch seemed a bit bland to me, but I think that could be solved by the addition of just a tad more salt. I could have used more spice, but I deseeded all my jalapeños to avoid bringing my tasters to tears. If I make them again, I would leave some seeds in or add 1/4 tsp or so of red pepper flakes to bring up the spice level a bit. These scones rose quite well, and had a nice, crispy cheesiness. They complemented pasta and red sauce quite well, I have to say. Definitely a repeatable recipe, with a few adjustments in the future.